Barbecue, as well as pool heating, are available for an additional fee and subject to availability. Contact us for details. 2 Sets of linens provided to each bed. **ATTENTION** The community pool will be closed from March 11th - April 15th / 2019. The pool is being acid washed, cleaned and receiving minor repairs. We’re sorry for the inconvenience. In case of any questions or concerns, please contact the resort’s corporate office and speak to Nancy Martell. PLEASE NOTE: This is only happening at the COMMUNAL pool located inside the clubhouse, not at the private pool inside the property. Thank you in advance. The house was beautiful and very spacious for my entire family. There were several things that needed attention but overall my family enjoyed the house. For one, I called about the slide screen to the pool area twice and that was never resolved. The bedding in the Super Mario room could use a little upgrading. There were small stains here and there. Nothing huge....And it would have been really nice if they had wash clothes to go along with the bath and hand towels. Again, I must say the home is extremely gorgeous and was very comfortable for my entire family. It was a beautiful home. It was quiet, and was as pictured. Nothing bad to express, and we would use it again. Did not get to experience the warmth of the hot tub or pool. The pool or hot tub did not get warm enough to enjoy. This was one of the main purposes of choosing the place to enjoy the hot tub and pool. Everything else was good except had to purchase wash cloths. There were none available. We really appreciate your feedback. Your opinion is very important to us. It certainly helps us identify weak spots in our service as we strive to provide you with the very best customer service. We are very sorry for not having been able to make your stay 100%. We truly regret that our service didn't reach your expectation properly. And while we understand that there is nothing we can do to change what had already happened, please accept our apology. And We hope to see you again and be given the chance to serve you better. The house was nice compares well to photos Location was close to stores and main roads. Beds were good. Towels very nice. Would stay again. Thank you very much for taking the time to review our property. It's always heartwarming to hear that you were happy with your stay. Overall I really liked this house and I would stay there again. 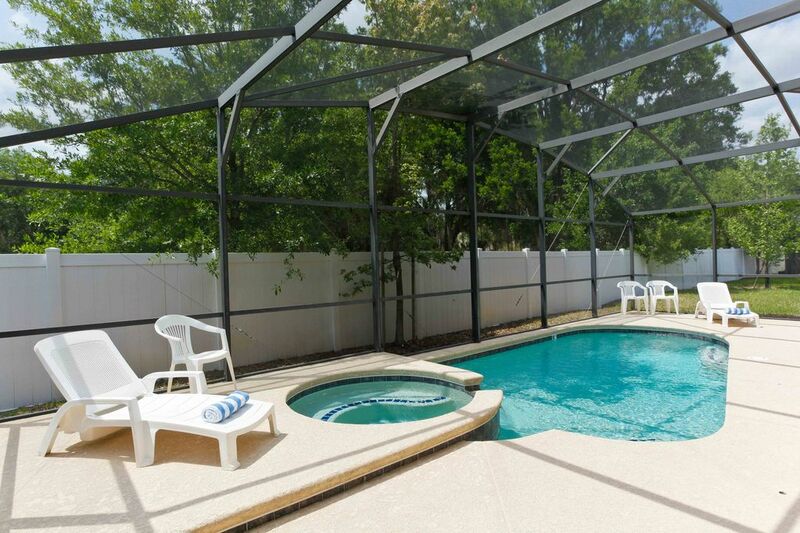 Good location only 15 minutes from Disney and 30 minutes from Universal. Many restaurants nearby, and a Super Target only 3 minutes away. Master bed comfortable, as well as the two twin beds in the Super Mario bedroom and the bed in other bedroom without an attached bathroom. However, the person in our group that stayed in the last bedroom (the other one with an attached bathroom) said that the bed in that room was not comfortable. All bathrooms were very nice with great water pressure. Good sized kitchen, dining and family room areas, as well as nice pool area. A sign by the thermostat said the lowest we could set it was 72 degrees, so we did, and it always felt cool and nice in the house. Washer and dryer worked well. My kids loved the game room in the garage. The first night we returned from the theme parks the battery had gone bad in one of the smoke detectors on a high up ceiling and was beeping every minute. Called the emergency number for the property management company (which is really just their regular number) and nobody answered; in fact it said their mailbox was full but it did allow me to leave a message. Waited 10 minutes but nobody called back. So I emailed them and marked it emergency as instructed, and within a minute a nice woman called me back and we talked. Luckily my husband was able to borrow a ladder from someone down the street and he got up and removed the smoke detector and its battery. Next day someone came by and tried to fix it but left a note that couldn't, but returned the next day and it was fixed. So if you have to reach them I would recommend to email. The pool pump to recirculate the water and spa function were not working the first half of our stay, but the pool guys came out on Day 6 out of our 10 day stay and they fixed it. No big deal for us since we only used the pool a few times anyway for a half hour each time since we were going to the theme parks a lot. Kids did finally use it at the end of the trip for a few hours one day and loved it. We really appreciate your feedback. Your opinion is very important to us. It certainly helps us identify weak spots in our service as we strive to provide you with the very best customer service. It was a pleasure to have you as our guest and we hope to see you again soon. We will never rent a hotel again! Homes with private pools, game rooms, and multiple bedrooms beat a hotel stay any day, our opinion of course. And for less than 2 separate rooms in a hotel. We had a great stay at this property. We had no problems entering or locking the front door, (keyless, and fantastic) everything was clean, and this house has alot of space. 2 living rooms, which i didn't notice with the photos at first. We loved it overall, and would love to stay again. Wow that is a really good news! Our team really appreciate your feedback. Your opinion is very important to us. It was a pleasure to have you as our guest and we hope to see you again soon.